US Corn Exports Lag; Global Corn Trade Boosted? Quietly, the non-corn feedgrain balance has gotten rather tight. 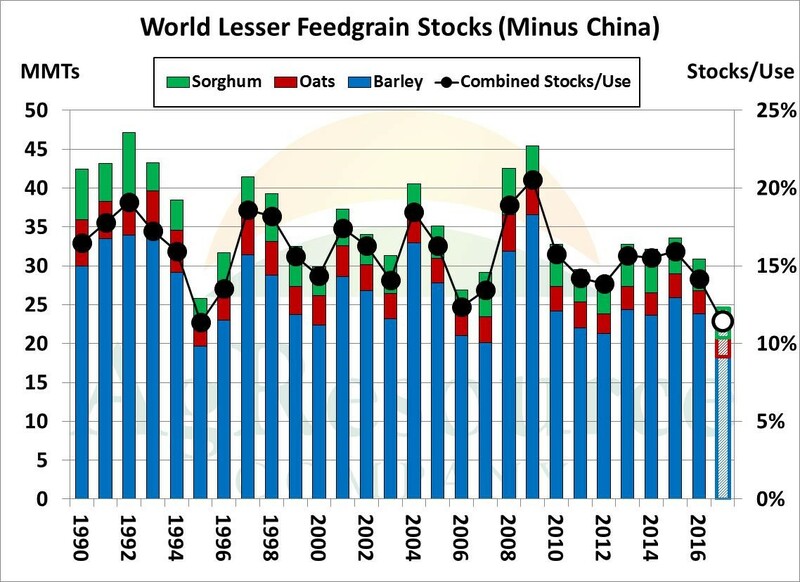 Excluding China, combined world sorghum, oat and barley end stocks in 2017/18 are pegged at just 24.6 MMTs, the lowest on record. Accounting for reduced consumption, combined sorghum, oat and barley stocks/use is projected at 11.4%, the lowest since 1995! 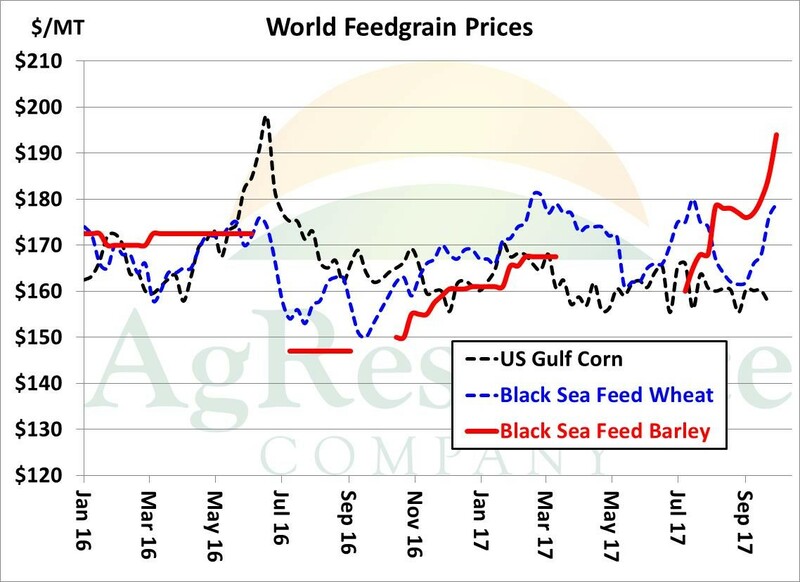 Certain markets (Saudi Arabia, namely) demand barley in their feed rations, and ARC’s work suggests the market may be approaching the level where lesser feedgrain demand becomes inelastic. Either the market buys more acreage or lesser feedgrain stocks fall even farther, or a heavier demand burden will be placed on corn in the years ahead. And it’s clear that feed wheat and barley prices are moving higher – and quickly. This week, barley out of the Black Sea region is offered at $195 per metric ton, a multi-year high and some $40/MT above Gulf corn. Notice that a year ago, barley has priced at a substantial discount to corn, and so things have changed. South America will benefit most from this in the near term (in years of normal production, South American corn shipments don’t begin to tail off until Nov/Dec), but the corn balance sheet as a whole looks to add demand via price. US sorghum stocks are down sharply, feed margins are decent, ethanol margins are very good, and so domestic corn use should be elevated in 2017/18. There’s a lot of corn still, but slowly the market is working to clear excess inventory. Don’t chase breaks when pricing the new crop.